By way of a comic narrator, Kafka’s readings of Abraham and his creation of “other Abrahams” are educational: they teach us how the other Abrahams are. I would suggest that, for Kafka, his Abrahams are schlemiels who, while acknowledging Kierkegaard’s Passionate Knight of Faith, also offer a challenge to it. Instead of passion and concentration they also offer us inertia and absent-mindedness. Kafka’s close descriptions of Abraham and these “other Abrahams” offer us something like a phenomenology of the schlemiel-as-prophet. After all, Abraham is a prophet just as much as Moses is; however, as Maimonides notes, his prophesy is weaker because it is oftentimes mediated by the imagination. Abraham’s spiritual poverty and the inertia of this poverty are an asset, they make concentration easier for him, or, even more, they are concentration already. By this, however, he loses the advantage of applying the powers of concentration. The punch line is that he, the narrator, and not Abraham can’t concentrate or understand the value of being concentration instead of using it. The voice of this piece, the narrator, is a schlemiel. Kafka seems to be telling us that the schlemiel’s job is to acknowledge pathos and inertia but, at the same time, not recognize it. Pathos is tainted by distraction – something the schlemiel knows well. Its not that the narrator is an anti-hero so much as an almost-hero. To be sure, this absent-minded joke about Abraham and his “spiritual poverty” resonate throughout Kafka’s Abrahams. The next Abraham addresses Abraham’s relationship to the world. The narrator criticizes him by saying that this Abraham falls prey to “the illusion” of not seeing the world as something uniform. By calling it an illusion, Kafka is being highly ironic. For Kafka, on the contrary, this is not an illusion. Yet, for the other Abraham it is. This is obviously ridiculous. And that is what a schlemiel is or does: he makes ridiculous claims. They are ridiculous in relation to Kierkegaard’s Abraham, the knight of faith, who, of course, is sickened by the uniformity of the world. Kierkegaard is preponderant in this regard; the Knight of Faith is obsessed with “the individual” and being “singled out.” And Abraham, for Kierkegaard, is the penultimate example of uniquesness. But the voice in this piece says something ridiculous which misinterprets this, once again. Or, rather, it doesn’t recognize pathos. The narrator contrasts this “real Abraham” to some of the Abrahams who may not even have a child to sacrifice. For them, the commandment was impossible. In response to this “impossible” commandment, the narrator told us Sarah Laughed: “These are impossibilities and Sarah had a right to laugh.” Lest we not forget, Sarah laughs at what would naturally seem impossible: giving birth to a child in her old age. However, here, the laughter is something specific that happened after Isaac’s birth. The point being that the narrator mistakes Sarah’s laugh for a general laugh: the laugh at the impossible commandment. This reading is fascinating because what she is laughing at is the schlemiels situation which is essentially impossible; however, what the schlemiel usually does is to act “as if” the impossible can still be done. This, of course, is ridiculous. But this is the condition of at least one of the “other Abrahams” who may not have a son to sacrifice. And it is to this part of the parable that Jill Robbins most closely illustrates her reading. Kafka, for her, is that “other Abraham.” Regardless of whether or not we read this parable, like Robbins, as an allegorical autobiography, the point remains: the narrator mis-reads Abraham’s specific, unique commandment by generalizing it. And this has the effect of challenging its pathos. This doesn’t detract from that Kafka, elsewhere, sees himself as commanded. The commandment remains but, as he points out there, it is hard to understand. His prayer, so to speak, is addressed toward understanding the commandment. To be sure, Kafka associates his commandment with prayer and humility. True faith is not lacking in him, he has this faith; he would make the sacrifice in the right spirit if only he could believe he was the one meant. He is afraid that after starting out as Abraham with his son he would soon change on the way into Don Quixote. The world would have been enraged at Abraham could it have beheld him at this time, but this one is afraid that the world would laugh itself to death at the sight of him. However, it is not the ridiculousness as such that he is afraid of – that he is, of course, afraid of that too and, above all, of his joining in the laughter – but in the main he is afraid that this ridiculousness will make him even older and uglier, his son even dirtier, even more unworthy of being called. This Abraham is already ridiculous; he fears becoming older the more ridiculous he becomes. This is telling. Here, Kafka, like Baudelaire and his imagining of an old clown in the circus, imagines what life would be like for someone like this Abraham, this schlemiel. What would it be like to always be a schlemiel? What would it be like to always be the object of ridicule? In the end, Kafka’s parable suggests that being a humble-laughing- stock is not easy. It’s hard to be a clown, and this life of ridicule deeply affects the body of the schlemiel prophet. The other-Abraham’s fear – the fear of a humble schlemiel – is that the more one is the pit of laughter, the more one will not be “worthy” of being called. This fear demonstrates the utter simplicity and humility of this Abraham. This other Abraham mis-recognizes the calling because he is caught up in the reality of being a schlemiel. Echoing the first joke, which was based on a mis-recognition of passion, these Abrahams are humble and absent-minded. They challenge Kierkegaard’s Knight of Faith since they misrecognize passion, don’t see themselves as worthy, and do not passionately relate to God (but this has nothing to do with their lack of faith; perhaps it has to do with the “inertia” of their spiritual poverty). 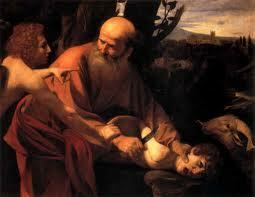 Unlike Kierkegaard, this Abraham doesn’t want to laugh with everyone. He is afraid of what will happen. And this makes sense. It reminds me of Andy Kaufmann’s reticence – near the end of his career – when facing a laughing audience. He can’t join in as he has lived with too much ridicule. What happens is that when one laughs, one becomes like a god in this moment of laughing with the gods. This Abraham can’t even entertain that. Its not that it’s ridiculous; rather, it is embarrassing. Ridicule exposes the schlemiel prophet and wears him down. In the end, the schlemiel doesn’t opt for pathos. He can’t. The Knight of Faith can. Perhaps that’s why the schlemiel’s best defense is absent-mindedness?